As the warmer weather sets in, begin increasing the frequency and quantity of your feeding. The Summer Staple Food has animal protein and color enhancers that are needed during this season. The added color enhancers are made up of astaxanthin (crab shell), spirulina and krill, which all promote brilliant color development. As far as we know, Ecological Laboratories is the first fish food manufacturer to commercially produce this type of food. Variety is the spice of life. If you don't have time to cut up fruits and vegetables for your pond fish, give them this "fruits and greens" blend. Ecological Labs has done the cutting and blending for you. There are apples, apricots, kiwis, mangos, papayas, peaches, pears, broccoli, cabbage, peas, red peppers, tomatoes, zucchini and spinach in this scientific blend. Feed above 68°F (20°C). Alternate feeding the two supplemental foods every other day (four days per week). Due to the lower protein content this can be alternated with the Cold Weather formula during colder weather as well. The Montmorillonite Clay provides additional minerals which help provide more immunity against viruses commonly found in pond environments. Additional quantities of vitamins are also blended into this food. Montmorillonite Clay also acts as a toxin binder by neutralizing metabolic toxins. In the late spring when the warmer temperatures arrive, koi and goldfish need a boost of protein for growth since they depleted their fat reserves over the winter. In the fall a higher protein diet is also required since pond fish need to bulk up in preparation for their winter fast. Use this feed at a minimum temperature of 68°F (20°C). Pond fish really start to grow at this temperature. You can use this feed up to four times per day. Feed between 2% - 3% of the fishes' body weight per day. For fish 4" and under. Mini Pellets were developed so that small fish have a high quality balanced diet food available to them. Recommended for fish 4" and smaller, this diet contains stabilized vitamin C to help promote proper tissue development. When Your Bigger Fish Deserve the Very Best! Legacy Variety Mix is the answer for how to feed a complete blend of fruits, greens, carbohydrates, protein, wheat germ, vitamins and probiotics to your koi and pond fish. 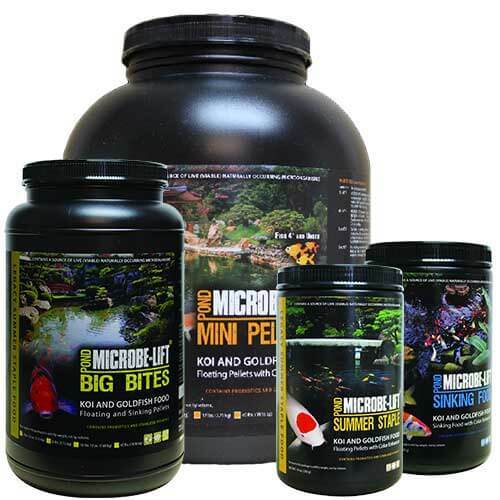 It contains 25% of each Microbe-Lift's most popular Legacy foods: FRUITS AND GREENS, SUMMER STAPLE, GROWTH AND ENERGY & SUMMER STAPLE w/ MONTMORILLONITE CLAY. Sinking pellets with added color enhancers. Legacy SINKING FOOD PELLETS are a great way to make sure your newly added pond fish receive balanced meals while adjusting to their new surroundings. Generally, new fish are "shy" until they become more familiar with their surroundings. Legacy sinking food is also great for stressed or sick fish that don't come to the pond's surface and feed off the bottom of the pond. In the cold weather of spring and fall, when the night-time temperature goes below 55°F but above 42°F, feed this cold weather formula. When the pond water's temperature drops, the fish require a highly digestible, cool-water diet. This cold water diet is made with lesser amounts of protein and contains wheat germ which is easily digested. This formula also contains a higher level of fats to prepare the fish for winter.